Here is my first sermon for my preaching class. It was well received. Feedback would be nice. It is the first day of class. We have heard various rumors or information about what the class is like and especially what the professor is like. Is the professor mean, scary or nice? How do they teach? What are their expectations? However, you do not really know until you actually meet the professor. As you begin to dialogue with the professor you get a better idea of who they are and their expectations for you. The beginning of the Gospel of Matthew is like that first day of class, full of expectation. We hear the story of Jesus’ birth and his genealogy. There are a lot of expectations about who Jesus is. Has he come as a king or a conqueror? No one really knows for sure. But there are expectations. Jesus is named and claimed as “The Son of God” at his Baptism. He is then lead into the wilderness to be tempted. As Satan begins to tempt and ask questions of Jesus, this is the first time Jesus speaks for himself. The first time Jesus finds his voice and tells us, who he is. This is where we find out if this Jesus, meets our expectations about who God is. Jesus is no doubt very hungry from fasting. Satan asks him “Turn these stones into bread if you are the Son of God?” He is the Son of God so sure we expect him to be able to do it. But NO! Jesus replies using God’s word “Man is not fed by bread alone but by every word of God” Jesus’ response takes this offer to satisfied physical need and defies our expectation with the promise of something greater. He offers to satisfy our spiritual need. The kind only God can give. Soldiers in the deserts of Iraq and Afghanistan deal with a variety of needs, physical, emotional and spiritual. We often settle for less. For the here and now. For the physical and not the spiritual. However, Jesus offers us more. Have you ever tried to bargain with God? , “God answers this prayer and I’ll go to church more?” or “If I don’t sin for a week, God will you bless me?” We put conditions on God. God does not want that kind of shallow faith. He wants our obedience. He wants our trust. Trust and faith are given, not bargained for. Trust and faith come with relationship. Joe Kapolyo a Zambian pastor writes “We can trust God for safety as we serve him obediently but, sometimes his will is best fulfilled by having to undergo suffering.” When we put conditions on God we forget about his unconditional grace. A grace so great he went to the cross to show us an example. Not because we asked or deserved it but because he loves us. Satan then asks his boldest question yet “Look at all the kingdoms of the earth. You can have power over all of these if you just worship me.” The Jews were expecting God to save them and show his mighty hand here on earth. We often expect our politicians to use their power as well, to strong arm and make the world the way they want it. Jesus rather forcefully tells him to get lost and with God’s word states, “you shall only worship the Lord your God.” If you know any history at all, you know that great leaders and empires come to power and fall again and again. 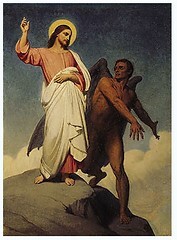 Jesus rejects the devil’s offer of earthly power. A power that will fade and wither away. Jesus came to proclaim the Kingdom of Heaven. Jesus offers us something better than we expected, his kingdom, his reign over heaven and earth. One that is eternal. After all Jesus is the Son of God. I think the hardest part of temptation is choosing whose expectations we will follow. Will it be our peers, our own, the media or our God? When I was younger and did something wrong, I often thought, “My Mom and Dad are going to kill me?” I knew they were not going To,. But I knew what they expected of me. I knew I had missed the mark. I had let others expectations affect what I did. Jesus being God’s Son knew his father intimately. My parents know me better than anyone else. I want to make them happy and I want to meet their expectations because I love them. I sometimes forget that unlike my human parents, God’s expectations come with a grace that is abundant even when I do not measure up. However, is not the end of the Jesus story. It is not the last we have seen of Satan. This is still just the first day of class. The beginning. As we get to know Jesus more, I wonder how he is going to change our expectations yet again? I was reading through the bible when I came upon the story of David and Goliath. It is a very familiar story for many. One of the things that struck me when I read it this time was David’s response before he kills Goliath. His confidence in God is amazing. You can also see an hint of anger. David was certain that the Philistines made God angry. He knew that God was going to punish them. David is also acknowledging his own weakness. He places the Lord as victorious, not him or anyone else. The battle is won only because the Lord won it. David’s response is something I wish I could live up to. I’m so worried about ME being victorious I forget who really is supposed to win. Jesus’ response echos David’s response. Jesus was not afraid to die, he knew who had to win. Jesus died so that God’s eternal plan for us would be victorious. He gave up his Life but, in the end he never lost it. God provided the greatest of victories. Victory over death. Originally uploaded by Kymberlee della Luce. I was reading through Matthew 5 the other day when I came across the “Sermon on the mount”. I have a habit of skimming through the bible. For some reason I was struck at this simple passage. Amazing!! At this moment in time I feel like I’m at the end of rope. It is not easy getting laid off and having to look for a new job. But, God tells us we are blessed during these times. We are blessed when we can rely on God to get us through. This passage in James is an echo of Jesus’ words in Matthew. “Dear brothers and sisters, whenever trouble comes our way, let it be an opportunity for joy. For when your faith is is tested, your endurance has a chance to grow, so let it grow, for when your endurance is fully developed, you will be strong in character and ready for anything. So when we feel like we are poor, helpless and at the end of our rope. We are blessed. We should live like we are. We are children of God. And that is what I plan to do.